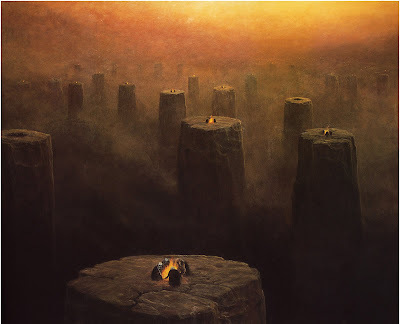 In 1975, the great Polish artist Zdzislaw Beksinski created a painting that I wish to consider here as a sort of master signifier, or key to understanding his work as a whole. The painting is untitled, as in fact, were all of Beksinski’s paintings since, like the untitled chapters of Finnegans Wake, Beksinski did not wish to confer on his images any specific meanings. “Meaning is meaningless to me,” he is famous for saying, but then, Beksinski’s profession was not that of a semiotician. His paintings most certainly do have meaning in them, if one knows where, and how, to look at them. The painting in question shows an image of a sort of man-creature crawling along the ground on all fours while apparently fleeing from the ruins of a burning city behind him. The man-thing’s head is completely wrapped in white gauze bandages, which are marked with a crimson stain precisely where his facial features would be, so it does not appear that he could see very well. And this is perhaps why he is using his right hand as a sort of blind man’s cane for palpating the ground in front of him, using fingertips as though reading Braille. The man-thing’s body is dark and possibly furry: in any event, his legs and arms resemble those of a quadruped. In the background, flames light up the windows of the tall buildings like thousands of burning candles. Rubble and wreckage are strewn everywhere. The colors are infernal, as though we were peering down into a crack in the earth which had opened up to reveal streams of molten lava flowing with orange, red and yellow incandescence through the earth’s interior. Now, the question: namely, whence comes this mysterious figure crawling its way along the ground in search of who knows what? The figure itself vaguely resembles a question mark turned over onto its side, with the bandaged head serving as punctuation point. The bandaged head recalls Grunewald’s 1504 depiction of The Mocking of Christ, in which Christ is shown being humiliated on his way to the cross, the top half of his head covered by a white bandage. Indeed, Francis Bacon alluded to this painting in his 1944 Three Studies for Figures at the Base of a Crucifixion. And, as it turns out, the image of the crucifix is one of the master signifiers of Beksinski’s art, reiterated over and over again from about 1968 all the way down to the late 1990s. 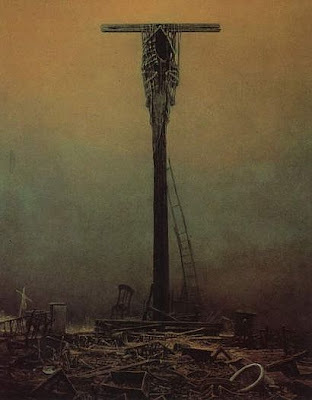 In one of his early crucifixion studies, furthermore, dating from 1969 (shown above), Beksinski painted an image of the crucified Christ with a crumbling, dessicated body that is falling apart. The body has separated away from one of the arms, which remains dangling on its own from the cross, while the rotting carcass is angled so that the head is turned away from the viewer. But when one takes a closer look at the legs of this figure, one notices that they are not those of a human being: they are far too long for that, and indeed are articulated in such a way as to resemble those of a bird’s. In fact, these legs are sufficiently similar to the quadruped legs of the crawling figure in the 1975 composition that we could even say, without sounding too rash, that the crawling figure is Beksinski’s half-human, half-animal Christ-being who has slid down from his perch at the center of the Western tradition, and gone scurrying away in search of clues to its fate. The 1969 crucifixion is a kind of Lacanian point de capiton, that is to say, a stitch point in his theory of the psyche that marks a stable intersection of a signifier and its signified. A sufficient number of such stitch points, where signifiers are anchored firmly to their signifieds, is necessary, in Lacanian theory, for mental health and confers stability on the patient’s world view. But when one of these stitch points comes undone, the signifiers come unattached from their signifieds and begin to slide around in the psyche, where they become floating signifiers looking for new signifieds to attach to them. Beksinski’s 1969 crucifixion, then, is equivalent to a Lacanian point de capiton that has come undone, for the image of the crucifix was, of course, the great master signifier of Western civilization that anchored meaning and gave form and purpose to the entire society. It was a signifier that was attached to a transcendental signified, namely, the Idea of the Descent of God to earth. But in the posthistoric civilization which we now inhabit, all such transcendental signifieds have been deconstructed and dismantled. They no longer function as they once did, as master signifiers to organize an entire civilization. The metaphysical age, as Beksinski shows in his 1975 painting, has gone up in flames all around us. Our present civilization is not so much postmodern, as it is posthistoric. As Vilem Flusser has pointed out, history proper began with texts (in the sense of textiles as weaves that held and stitched the signifiers of Western civilization together with their signifieds). Writing, especially in its alphabetic phase, originated as a criticism of the images of the mythical consciousness structure, for both Plato and the Hebrew prophets have in common a shared antipathy to images. Writing is a criticism of such images, a criticism that flattens out the two-dimensional surfaces of mythic icons into the one dimensional lines of written texts. But with the advent of the techno-images of the Vision Machine that began with photography in the nineteenth century, and which has accelerated since then into the dizzying unfolding of ever more and more elaborate Vision Machines, it is the two-dimensional image surfaces of the mass media that have come to displace writing and hence, along with it, historical consciousness. Writing creates history. To live in a civilization in which writing becomes secondary, or even tertiary, to images, is to live in a posthistoric civilization. Thus Vilem Flusser. In a posthistoric civilization, the texts that once acted as weaves stitching together signifiers with their signifieds have all come undone, and so now we are faced with a proliferation of free floating signifiers looking for new signifieds. The signifiers have come sliding free, just as in Lacanian theory when a Borromean knot that weds the three orders of the imaginary, the symbolic and the real together comes unraveled, the result is semiotic chaos, and hence, a psychosis. We are now living in the midst of a civilizational psychosis. Hence, the creature in Beksinski’s 1975 painting, who palpates the ground with his right hand — the hand that once upon a time wielded the pen — as though searching amongst the midden heap that surrounds him for some new signified to which this formerly transcendent crucified man could reattach himself. He is Flusser’s posthistoric man, desubjectivized and destratified; unplugged, that is, from all previous sign regimes. Deleuze and Guattari’s signifying and post-signifying sign regimes (as discussed in A Thousand Plateaus), which together constructed Western civilization, have ceased to function for posthistoric man, who has been desubjectivized and stripped clean of his signifying identity. In fact, he has been destratified from the sign regimes into which he had once been firmly locked in place on the plane of organization, and has now come disattached, a floating signifier drifting out onto the (horizontal) plane of consistency, where all previous forms of signification liquefy into an asignifying plane. (Hence, when Beksinski says, “meaning has no meaning for me,” it is precisely because his central figures have come unplugged from all previous sign regimes, especially the signifying sign regime that locked them into systems of transcendent meaning. The signifying (paranoid) and post-signifying (or subjectifying) sign regimes which Deleuze and Guattari discuss in A Thousand Plateaus are equivalent, more or less, to Jean Gebser’s mental consciousness structure and to Heidegger’s metaphysical age. All such ages, together with their accompanying sign regimes, have now collapsed). The ruins of the burning buildings in the background of Beksinski’s painting have not only folded into them Auschwitz, Hiroshima and the firebombing of Dresden (the planetary war in which all systems of meaning and their grand metanarratives were melted down into the posthistoric slag heap), but also the backgrounds of the burning buildings in the paintings of Hieronymous Bosch, especially in works like The Temptations of Saint Anthony (above), the Hell panel of the Garden of Earthly Delights and Tondal’s Vision. These works were painted in the middle of the sixteenth century, and they too, signify a time of collapse and disintegration, for they are stress reaction images of the meltdown of the Medieval macrosphere and its shift into what was then a new age, the age, namely. of Heidegger’s World Picture and Spengler’s Infinite Space into which the Medieval iconotypes, with their naive and quaint view of man as God’s gardener on earth, dissolved into perspectival space. At that time, as Marshall McLuhan has pointed out, the media were shifting from orality and illuminated manuscripts to the new kind of literacy configured by the printing press, a kind of literacy in which visual space was favored, and the sense of sight stepped up at the expense of the other senses, especially those of hearing and touch. 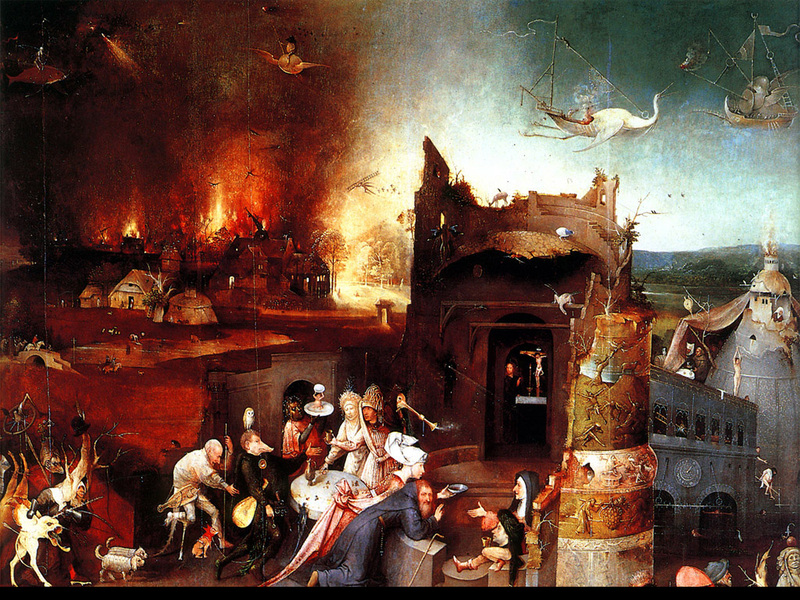 The collapse of the Medieval sensorium, with its highly tactile and involving nature, was registered by painters like Bosch and Bruegel, and literary artists like Shakespeare and Cervantes, as a catastrophe. Hence, Bruegel’s Triumph of Death as the triumph of visual, three-dimensional space inside which objects exist, as opposed to the Medieval order where they glow with their own self-luminous energies like the newborn infant Christ in Geertgen Sin Jans’s 1490 Birth of Jesus (shown above). But ever since the nineteenth century, and coinciding both with the rise of Paul Virilio’s Vision Machine and the twilight of Flusser’s historic mentality, the sense of sight has been gradually stepped down to allow the senses of touch and hearing to configure acoustic space, which is spherical rather than box-like, while melting down visual space, as reflected in the shift from three dimensional painting to aperspectival Modern Art. Beksinski’s mysterious creature reminds us of this shift, too, for he cannot see: that is to say, his sense of sight has been stepped down as the world of visuality dissolves into ruins behind him, while he uses the sense of touch to palpate his way along like the blind men in Bruegel’s painting The Blind Leading the Blind. We must feel our way, nowadays, through the ruins of the midden heap, using other senses than that of the merely visual, to orientate ourselves in posthistoric society. The sense of touch is discontinuous rather than linear, while acoustic space is spherical and, as it were, all-at-once. Surrounding the planet with electromagnetic pulse signals melts down visual space and configures an all-round space of simultaneity, enabling everyone to be everywhere, and anywhere, at all times via iconic and electronic avatars. Point of view, which presupposes location on a Cartesian grid with precise coordinates in space and time, simply vanishes under such conditions. The crawling figure who feels his way through the ruins of the midden heap is in quest of new signs that will make sense out of his essentially a-signifying existence. He is Christ, the master signifier of the metaphysical age, recoded as the desubjectivized entity each one of us has now become in posthistoric society, who is on his own and must sift through the ruins of the imploded metaphysical age that now lies behind us, where systems of meaning had been preestablished and fixed for us in advance, like the discourse of Lacan’s Big Other. Now, with the liquefaction of all semiotic systems and sign regimes, each of us is washed ashore on his own world island where he must act as a bricoleur to retrieve from the midden heap whatever signifiers will make sense out of the path he must create for himself as he lays it out. Private, as opposed to public, semiotics, in other words. Indeed, in Beksinski’s art as a whole, the theme of the midden heap is a recurring motif. In painting after painting, his image of the crucifix presides over a ruined heap of broken forms, as in the 1983 painting (shown above) which displays the cross with a pile of bones in place of Christ upon it, standing atop a heap of wreckage: discarded bottles, broken chairs, ruined furniture, empty washbasins, etc. A ladder extends from the midden heap to the cross, as though to suggest the construction of a subject out of whatever signs lay ready to hand, like the Lacanian Subject that is constructed out of scraps of signifiers from the discourse of the Other. This once mighty master signifier that shaped and built the metaphysical age has formative power no more. It has come unglued from all sign regimes and now remains only as the ghost of a vanished world, presiding over ruins. The midden heap, though, is precisely what each civilization inherits from the previous one. The Renaissance, for instance, was built out of a negentropic reversal and retrieval of scraps from the midden heap of antiquity, in which discarded archetypes and signifiers, such as the statue of the Laocoon group, were recovered almost daily and used to build a new humanist civilization. As McLuhan, in his book From Cliche to Archetype has remarked, the artist retrieves discarded archetypes that become new cliches to function as depth probes for new environments. Each new environment that is configured by a new technology or a new medium scraps the one before it onto the midden heap of all previous technological and cultural environments. Milton, for instance, in his Paradise Lost, scraps all the pagan divinities by tossing them into the midden heap of his Hell, from whence they are retrieved by the Romantic poets and painters of the nineteenth century who use them to construct a counter environment of pagan divinities against the industrialized world of factories and machines. Arnold Bocklin or Franz von Stuck as against Courbet or Manet. Modernist Art, likewise, is built out of the scrap heap of all the signifieds from the world’s pre-signifying sign regimes: African art, Oceanic Art, Native American art, etc. And so, the cross today can preside only over the midden heap of the collapsed metaphysical age, where all its archetypes, signifiers, signifieds, metanarratives and machinic assemblages have been tossed into the rubble to be found by some future civilization which will retrieve from it the various bits and pieces which they will use, during some far distant Volkerwanderung, to construct a new society. That is precisely what the palpating right hand of Beksinski’s creature is looking for: signifieds from the midden heap of the collapsed metaphysical age that will recode it and plug it into a new assemblage of enunciation. But that future assemblage, whatever it will be, remains too far off for us to see what its lineaments might look like. Each individual today must become his own semiotic machine who constructs his own personal assemblages. Civilization as an Anthropogenic container, to borrow a term from Peter Sloterdijk, is a thing of the past, for now each individual is stranded upon his or her own semiotic world island, like the various colonies of isolated people sitting around camp fires in one of Beksinski’s 1975 paintings (shown below) each gathered atop a kind of geological precipice that is separate from all the others. So, in Beksinski’s untitled 1975 painting, we have seen how his sub-human Christ figure has come down from its formerly exalted place on the cross, where it once formed a point de capiton to hold meaning in place, to crawl upon the surface of the earth in quest of new significance. Thus, the Christ image that was once held up toward the sky to signify the descent of God to earth has shifted to a more chthonic, earth bound image, of a sub-human and bestial Christ figure that has demorphosized and destratified to the status of a becoming-animal. Note that in Deleuze and Guattari’s pre-signifying regime of signs (or, if you prefer, Gebser’s magical consciousness structure), the destratification of the human into a becoming-animal was regarded as a positive thing, indicating the ability of shamans to slip in and out of communion with pre-human animal spirits and totemic beings. 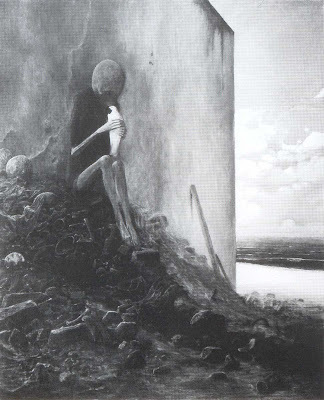 But Beksinski’s image of the Last Man at the End of History is more troubling: its devolved and dismantled humaneity, if we may put it that way, indicates the ontological status of the human being after Auschwitz and Hiroshima. The human being, that is to say, has become a posthuman, bestial creature who has lost his once exalted status. In the age of humanism, Christ on the cross was the great symbol of a drawing upward of the gaze of the human spirit towards a higher ideal, that namely, of the Man-God who had descended to earth to lead the human entity to the heavens. 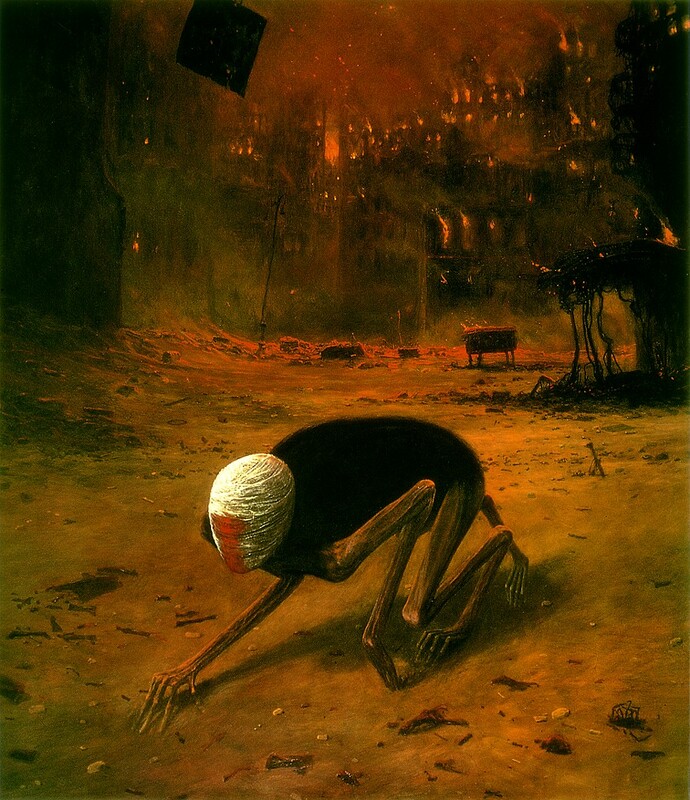 In the posthistoric age configured in Beksinski’s painting, however, the sub-human Christ-creature crawling pathetically on the ground like some wild beast is a devolution and descent toward something much more pathetic and disreputable: the type of human capable of loading millions of people into gas chambers and thus reifying them as desubjectivized things to be transformed into ash heaps. But the production of technologies for reducing humans to ash heaps on a mass scale was one of the major industries of World War II: for the degree to which technology could be pushed toward recreating eschatology on earth was one of its main projects. The nomenclature of World War II technologies all have a faintly apocalyptic ring to them: Vergeltungswaffe, the Final Solution, the atom bomb, etc. These are eschatological technologies produced by human beings attempting to appropriate the powers of the gods, but not to nobler purpose, rather for more and more efficient ways of wiping out larger and larger populations. And these are the kinds of technologies that segue us effortlessly into Foucault’s and Agamben’s Biopolitical Age, in which the concentration camp becomes what the prison, the hospital, the clinic, the school and the factory had been for the previous Institutional Age. For the first time, during World War II it became possible to actualize the Last Judgment using technological systems of mass extermination. And hence, the human being, viewed through the lens of such technologies, shrinks precipitously to the level of an insect, precisely in the manner, and from the vantage point in the heavens, from which a God might view him. The ontological status of such a creature is no longer human at all, but rather sub-human. And so, Beksinski’s demorphosized Christ-creature becomes for those of us living at the threshold of the 21st century an image of the Last Man at the End of History, the posthuman being of Heidegger’s Letter on Humanism, whose humanistic tradition of dictating to Being has led to apocalypse and mass atrocity. Humanism, as Heidegger pointed out in that essay, has failed us, leading only to the brink of an abyss from which we might not be able to turn back. Using technology to dictate to Being, instead of listening to its shepherd-like call, has led to the meltdown of our cities and of our properly human status, once celebrated so nobly by Pico della Mirandola in his essay Oration on the Dignity of Man. In that essay, written during the height of the Renaissance, Pico placed the human on an ontological scale between the angels up above and the beasts down below. But in Beksinski’s painting, the posthistoric human now exists somewhere between the insects and the beasts. His is a being that crawls upon the ground and who studies it for signs. Its axial orientation is horizontal, like that of an animal, and it can only look down (insofar, that is, as it can see anything at all) at the earth, never up. Few characteristics, other than the palpating right hand, remain to differentiate such an entity from the beasts. The hand now reads the ground, as it once read the stars. The image icon appropriate to such an age (and the very icon that appears on the cross of a 1978 Beksinski crucifixion [below] where it has displaced the signifier of the human Christ with that of a spider-like insect) is rather that of Kafka’s Gregor Samsa lying in his bed on his back unable to right himself while squirming his many insectile legs. Kafka’s image, take note, is essentially that of a horizontal crucifixion in which the signifier of Christ has slid away from its signified anchor as “man-God” and been replaced by the signifier of a giant man-bug. Thus, Beksinski’s image of the crawling, devolved man-creature has traded the heaven archetype out for the earth archetype, for in almost exact proportion to the degree to which, with ever mightier and more astonishing technologies man has raised himself to the status of the ancient gods, technologizing their powers, he has lowered himself ontologically to the status of a posthuman creature of a Biopolitical Age in which, as Agamben has pointed out, the concentration camp is the emblematic institution. Indeed, Beksinski’s creature has been, like Agamben’s homo sacer, desubjectivized: that is to say, unplugged from the signifying and post-signifying sign regimes (in which, as D&G pointed out, he was configured as a passional subject) and stripped clean of all individuality. (In the post-signifying regime initiated by the Hebrews, who did away with human sacrifice at the precise time in history in which they punctuated, in Lacan’s sense, the creation of the human being as a Subject, Moses becomes the first Subject; later, with Descartes, who inherits and combines the post-signifying with the paranoid signifiying regime, the point of subjectification becomes the cogito). Hence, the significance of the bandages that defacialize and effectively wipe the slate of the face clean, for where the bandages of Grunewald’s Christ serve to highlight his humiliation and underscore his humanity as a suffering subject, the completely covered face of Beksinski’s Christ-creature has been defacialized, its human visage effaced and removed so that no trace of its subjectivity remains. It is a thing, in other words, not a three-dimensional human individual. And the defacialization, which Beksinski, from his earliest work in photography had been concerned with all along, serves to reduce the visage to a posthuman prosthesis and blank slate awaiting the inscription upon its surface of new codes and new signifiers. The defacialized man, with which twentieth century art has been so preoccupied, is essentially inhuman, a visage created not by the process of what Peter Sloterdijk calls “protraction,” in which the human visage has been, through interfacial relationships between humans over millenia, extracted from its animal origins as a snout with fangs, but rather “detraction,” in which the portrait becomes a detrait and the face dismantled. This is not the face of the metaphysical age in which, as in Lacan’s mirror stage, the image staring back at the infant essentially humanized it and created the fiction of its ego in response, but rather, the face staring into computer monitors, security cameras and other electronic apparatuses that rob and disinvest the facial visage, conferring on it an apathetic and indifferent countenance. The posthuman face, in other words, created not by looking and interacting with other human beings, but by interacting with dehumanizing machines. The posthistoric human is a-signifying: numbers, as at Auschwitz, are more appropriate designations for him than names derived from humanist and mythical narratives. This is a type of being who has been stripped of all protections of the juridical macrosphere that once guaranteed and gave him his rights and reduced to the status of a homo sacer who can be killed with impunity precisely because he has no rights. But these posthistoric humans of Agamben’s Biopolitical Age are precisely what Beksinski is foreseeing here: his creature crawling along the ground, from which all protective civilizational macrospheres have been stripped away, is precisely Agamben’s homo sacer who presently inhabits all the refugee camps of the world in places like Darfur, Rwanda, Serbia, etc. Beksinski, as all great artists do, clearly foresaw what lay ahead for us, the posthistoric human being, now polarized into Fukuyama’s Last Man at the End of History and Hobbes’s First Man of prehistory. The Last Man is the human being as ubiquitous consumer, capable of participating in global free trade agreeements and the endless circulation and proliferation of free floating signifiers and signs; and Hobbes’s First Man, whose life is nasty, brutish and short, that is to say, the life of the Third World human being who is slowly proliferating around the planet and may even, as Hurricane Katrina showed us, soon irrupt into the civilizational fabric of our world cities everywhere. As Heiner Muhlmann pointed out, the Roman gladiatorial arenas were essentially zones of exception, of maximal stress, that is, that were demarcated on the inside of zones of cooperation (i.e. cities), so that the brute struggle of zoological existence walled onto the outside of cities as eternal zones of stress and conflict could be carefully caged and staged on the inside of city life as zoological exhibits. But nowadays, such zones of exception, of stress and conflict, are constituted not by gladiatorial arenas but by refugee camps that are slowly emerging within zones of cooperation and juridical order everywhere, as posthuman fabrications of purely zoological human beings who have no rights because they have no cities. Beksinski’s art, therefore, is an art that captures the revised ontological status of the posthumanist being of the Biopolitical Age. It is a being for whom all systems of signification have disintegrated and who sits atop the midden heap of the metaphysical age, picking through the discarded signs and wondering what they must once have been used for. This entry was posted on Wednesday, April 24th, 2013 at 1:10 pm	and is filed under Uncategorized. You can follow any responses to this entry through the RSS 2.0 feed. You can leave a response, or trackback from your own site. I’m unaware of any thinker that is making so much sense out of the 20th century just 13 years out. Obviously human beings will survive this cataclysm one way or another..and they will do so by monadologically constructing private spheres of significance. It’s exciting to think of the variety that might exist 100-200 years down the road as each seed sort of springs it’s own version of the cosmos, however intimate. It’s also chilling to think about everything else. Nevertheless, I think you’ve correctly identified something about this present moment that has really escaped the intellectual community at large, but in a sense, who cares? If anything, this essay is really an example of itself, and proves its point by existing on the envelope of public/private….at this moment anyways. Well done…I’m floored by this. I certainly hope you read these comments. I am delighted by your (seemingly) newfound interest in world history of consiousness or The (Hegelian) Spirit (Mind) – Geist. I would love your next book to be an Ebert version of “The Origin and Goal of History.” I remember once somewhere you were denouncing the inability of academia to get a firm grip on what is going on, and being somehow muted in expressing any real insight into the human condition of our age (it certainly brings to mind for me the immortal Dylan and the line “something is happening here but you don’t know what it is, do you? Mr. Jones?”). Anyhow I don’t much like one-off comments like this and have actually, on several occassions, considered re-joining Facebook just to interact with you! A suggestion though: have you ever read AdBusters? This is exactly the kind of thing they publish and I think you should submit it to them. They are always calling for writers to submit essays, and often have to resort to book excerpts for lack of good submissions. The essay has sat with me a little…some thoughts. — It is often over-emphasized that with the atom bomb we suddenly had the capability to wipe ourselves/each other out, but as some historians have correctly pointed out, the Mongols are the best example of a pre-modern peoples who had those capabilities, and exercised them, long before the west was again a player on the world stage. So I wonder if there is something in play that, as far as I can tell, you failed to mention: the images of the destruction. You did bring up technology, and how now one man, in a far off room, can reduce populations to ash with the push of a button, whereas the Mongols had to wade into the humanity and exert considerable effort to reduce a population to ash. That being said, it could be argued the Mongols were actually more efficient at it than our nuclear weapons were. But in this era, we can see pictures of the destruction and have that broadcast around the world, and the possibilities are far more menacing in the mind of distant peoples. Again, you touched on all these points, but I wonder if the possibility of destruction is in fact an after-effect of the much more profound uprootment of the self (perhaps that was exactly your point?). — The passage about the Roman Collusium was enlightening, and it brings up a theme I often think of whilst reading your material: American Massacres. I still have difficulty understanding Newtown/Aurora-type incidents, but I almsot wonder if they are some sort of erruption of violence (chaos) into the “zones of cooperation” that result from, as you say, the “defacialized” interractions of “post-humans” with the onscreen violence of TV/etc. (I wonder if we could say the spectator-sport nature of warfare in Hegel’s age, when citizens would attend a battle with a picnic basket, would serve a similar purpose). — This brings me to Deleuze and Guattari. I notice you seamlessly integrate their terminology into your discussions (I’ve noticed this elsewhere, as well), and it abounds here. As regards the Massacre situation, I also think often of Freud and Civ. and its Dis., and usually consider that in conjunction with D&G’s chapter on the war machine. In other words, without sufficient “capture” by certain apparatus (the “State,” but perhaps here we can say The Church or, at least, the Christ figure)…anyway, without sufficient capture the ‘animal’ instincts of man run amok amongst the “civilized.” If we are in fact “posthumans” groping across a “midden heap” it would make perfect sense to me that we would prey upon each-other in a seemingly random and novel fashion (“prey” doesn’t even seem like the right word, it seems a “posthuman” would be incapable of that much direction, but I can’t think of a better term). — I wounder if we could tease out more D+G here, for example the oft-spoken of “regime of the signifier” in chapter 4 takes on a much more profound meaning here, whereas I originally read it as simply a discussion of linguistics (which I still believe it mostly was). Also they have a whole chapter on “faciality” and the Body Without Organs. I almost wonder if the “posthuman” is supposed to be a body without organs? If in fact postmodern society is a BwO? I won’t take all the references to their (potentially) logical connections to what you’re saying, and to anyone whose read A Thousand Plateaus your references are clear. But I at least want to posit a question: could we say our whole civilization has become a “Body Without Organs?” Interestingly enough, as I was reading about the fall of Romae and the early middle ages (just today) I wondered if you could say Europe, or at least Brittain, became a body without organs once the Roman State withdrew itself. Is it possible that the “New Media Invasion” has turned our culture into a BwO? — the thoughts/connections abound, but I feel I may have taken advantage of the hospitality of this comment section. The last thing I would say is I too thought of Heidegger during this discussion and although I do not have a firm enough grasp of his concepts yet to talk about them at length, I feel I have a better grasp on what he was so insistend upon communicating with Being. We need to “look up” as you say, to a being, transcend humanism and “being,” in order to bask “in the light of the truth of Being” to really “ek-sist” as humans. I almost see this essay as an elaboration on Letter on Humanism, one that makes it far more relevant to me. Thanks you again. I will certainly be re-reading chs. on linguistics and fasciality in ATP, and continue reading Heidegger with, hopefully, newfound insight into his expounding upon Being. Please continue with the writing, it is desperately needed, and desperately appreciated.